Today is an awesome day! My goal of having my cancer story shared in as many languages as possible on all seven continents is moving forward as I launch my first Amazon Alexa Skill - Surviving Throat Cancer. An Alexa Skill is the voice app that works on any Alexa-enabled device. (iPhone has apps, while Alexa has skills.) My skill, which is called Surviving Throat Cancer, can be enabled for free right through Amazon.com. On it, you will hear my voice on several audio recordings talking about a range of topics related to HPV throat cancer: prevention, treatment, caregivers, survival, and more. 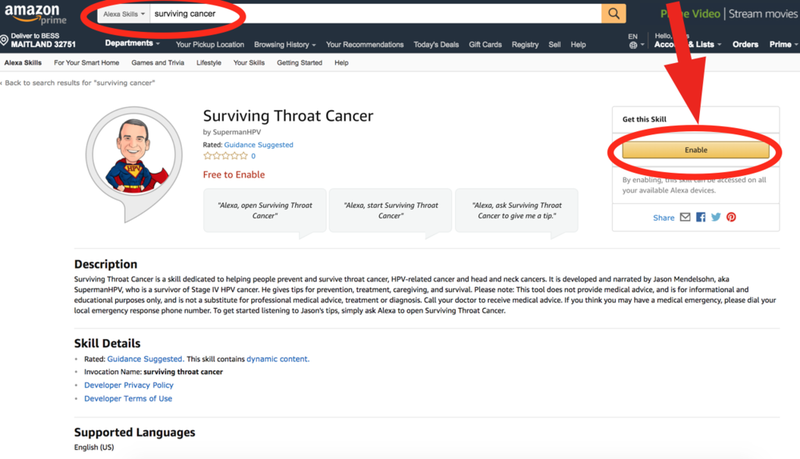 To find my skill, simply search "cancer" or "surviving cancer" on Amazon.com under Alexa Skills, and then look for my SupermanHPV logo. You then can "enable" it to listen and interact with it on your Alexa-enabled device. Once enabled, you will can say, "Alexa, open Surviving Throat Cancer." My hope is that by creating this Alexa Skill, HPV throat cancer patients, caregivers and survivors will receive information and inspiration which will allow them to remain positive and informed during a difficult time. Through my personal experience, my hope is that globally men and women will understand that they to can make it through this temporary although painful experience, understanding that after surgery, chemo and/or radiation life can be fantastic with their family and friends. Surviving Throat Cancer will provide sixty second clips touching on all aspects of my journey, and will educate those not familiar with HPV, the HPV Vaccine and treatment why oral cancer screenings and discussing HPV with your Ear, Nose & Throat (ENT) doctor, dentist, children's pediatricians and family practice doctors is important to remaining healthy, and keeping your kids safe from HPV cancer. Please share my Alexa Skill - Surviving Throat Cancer with your friends, family, social media contacts, and physicians. You never know who it will help, and who may have symptoms currently that warrant the attention of a physician. My hope is that through sharing this information people will go to their physicians sooner than later to beat a cancer that can be beaten!